Galaxy Note 7 SIM card guide explains the correct SIM card size for Galaxy Note 7 and the differences between the single SIM card version of Galaxy Note 7 and dual SIM version. Detailed steps of installing and removing SIM card in Galaxy Note 7 were also discussed. What’s the type (size) of Galaxy Note 7 SIM card? Galaxy Note 7 SIM card size is nano-SIM, which is the “fourth form factor” (4FF) of the SIM standard. If you are currently a Galaxy Note 5 user, it is not necessary to change SIM card. But if you are upgrading from Galaxy Note 4 (which uses micro SIM), you have to change SIM card. Some other popular phones that use nano-SIM card include Galaxy S7, Galaxy S7 edge, Galaxy S6, Galaxy S6 edge, Galaxy S6 edge+, Galaxy Note 5, iPhone 6S, iPhone 6S+, iPhone 6, iPhone 6+, iPhone 5, Moto X (including all generations) and many more. So, if you are upgrading from those phones to Galaxy Note 7, you can continue to use the existing SIM card for Galaxy Note 7 (provided you do not change carrier). However, if you upgrading from other older devices, you cannot use your existing SIM card on Galaxy Note 7. You have to contact your carrier to get a new nano-SIM card. You should NOT trim your existing SIM card to nano-SIM card. 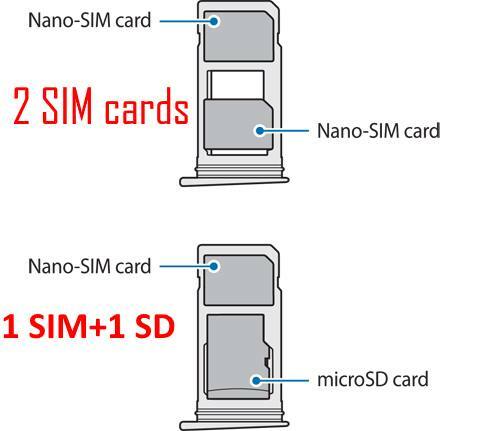 The thickness of nano-SIM card is different from all previous generation of SIM cards. Nano-SIM card is 0.67mm in thickness, and all other SIM cards are 0.76mm (this is not a typo, it is 0.67 mm vs 0.76mm). What is the difference between Galaxy Note 7 dual-SIM model and single SIM model? Galaxy Note 7 has two variants: single SIM version, and dual-SIM version depending on regions. For single SIM card version of Galaxy Note 7, you can only use one SIM card. While the dual-SIM version allows you to use up to two SIM cards. Please note, Galaxy Note 7 dual SIM version is dual standby, NOT dual active. At any time, only one SIM card can be engaged in voice communication. You cannot convert single SIM version of Galaxy Note 7 into a dual SIM version. The hardware and firmware of single SIM version does not have the necessary components for two SIM cards. The major difference of these two variants is in Galaxy Note 7 SIM card tray. The single SIM version of Galaxy Note 7 SIM card tray has one slot for SIM card and the other slot is for micro SD card as shown below. You cannot fit a second SIM card into the micro SD card slot. There is no cutout for SIM card in the micro SD card slot. The dual-SIM version of Galaxy Note 7 SIM card tray can be used differently. Slot 1 can only fit a nano-SIM card. However, slot 2 can fit either a nano-SIM card or a micro SD card (not both), as shown below. You can find the cutout for SIM card in both slots. Although the size of the Galaxy Note 7 SIM card tray in both versions is identical, the firmware and hardware difference will prevent you from using two SIM cards in the single SIM version. In other words, getting a SIM card tray for dual SIM version of Galaxy Note 7 will NOT convert your single SIM version of Galaxy Note 7 into a dual-SIM phone. Don’t waste time or money on this. How to insert SIM card to Galaxy Note 7? You may follow these steps to insert SIM card to Galaxy Note 7 as shown below. You should insert the ejection pin into the hole in Galaxy Note 7 SIM card tray, press it hard to loosen the SIM card tray. The ejection pin can be found in your Galaxy Note 7 box. Step 3: Place the SIM card into the SIM card slot following the cutout with gold-colored contacts facing downwards. How to remove/exchange SIM card from Galaxy Note 7 battery? Do you have any questions on Galaxy Note 7 SIM card size? Do you know the the difference between the single SIM and dual SIM versions of Galaxy Note 7? If you have any questions on Galaxy Note 7 SIM card, please let us know in the comment box below. You can get the official Samsung Galaxy Note 7 user manual (user guide) in your local language inGalaxy Note 7 user manuals page. Is the sim card activated? You can check settings – about device – status – sim card status. Btw, for your safety, you should not use Note 7 any more. A verizon rep told me that the sim card in the note 7 will not work if placed in an iPhone 6s plus because it has NFC on the sim card. To you knowledge is that true? Probably not true. NFC is just an added feature to the SIM card. But some carriers may require you to activate NFC feature in the SIM card when you put the SIM card into other phones.